Even if you haven't heard of steampunk you've probably seen it, recently I found myself wondering what a steampunk guitar might look like. While it began as a literary genre, steampunk ideas have gradually pushed into mainstream culture; Sherlock Holmes faces villains with remote controlled bombs, Van Helsing uses an automatic crossbow (which Hansel and Gretel seem to have borrowed), a charge that might have been led by Doc Brown's flying train from Back to the Future. Where do guitars fit into this? The modern guitar player is often a bit of a traditionalist, Les Pauls and Stratocasters date back to the 50's, what we think of as a modern instrument is over 60 years old and, aside from ultra-modern design like the Variax, the basics are still the same: a piece of wood, a magnet and lots of coils of wire. Few other instruments make sound by manipulating electromagnetic fields and, aside from the theremin, the electric guitar is probably the one modern instrument that James Maxwell, Nikola Tesla, et al. would immediately understand. It wouldn't be very out of place to find one in a 19th century workshop. The steampunk tendency to put pipes on things might suggest something like the amazing Hutchinson SP-1, but you could argue for a much simpler appearance. For a long time I didn't like how one classic guitar looked, there was something unfinished, even a little industrial about it compared to the space-age Stratocaster or beautifully crafted Les Paul. 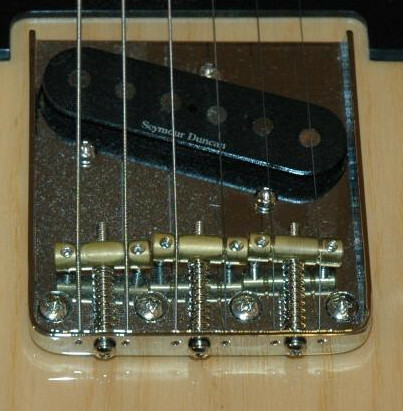 Which is ironic, since even its name comes from the very start of the space age, the Fender Telecaster was built in 1950 by Leo Fender, but only the powerful magnets (AlNiCo was discovered in 1931) mean you wouldn't have seen one in The Great Exhibition. The large steel plate holding down the bridge, the chunky simple body outline and bolt-on neck all speak of the same belt-and-braces approach to engineering that led to Hammersmith Bridge. Amplification would have had to wait a while, or maybe some kind of stream-powered organ could have been rigged up, but the Telecaster would have been right at home in a dressing room recital, possibly accompanying a Stroh violin. The Tele doesn't need clockwork to be a steampunk dream. Like the birds, Victorian technology evolved, but like them too, every electric guitar still shows its heritage and a few of of them still have claws. If you still feel more brass cogs are needed to be really steampunk it might be worth checking out this flickr gallery or techeblog's article.